From 10 am to 8 pm. Water features: water skiing, donut, hydrofoil, wake, surf towed: EUR 3 / minute. From 18 to 20. Spend with us a couple of hours of relaxation and fun! Do you want to spend a few hours with your friends, darting on the waves of Cagliari’s sea? Come on our boat Sessa Key Largo 22: you can learn how to wake surf, by yourself or with your friends! Jump on our towable inflatable donut, mattress, banana boat, wakeboard or hydrofoil: sports and entertainment in a single package! 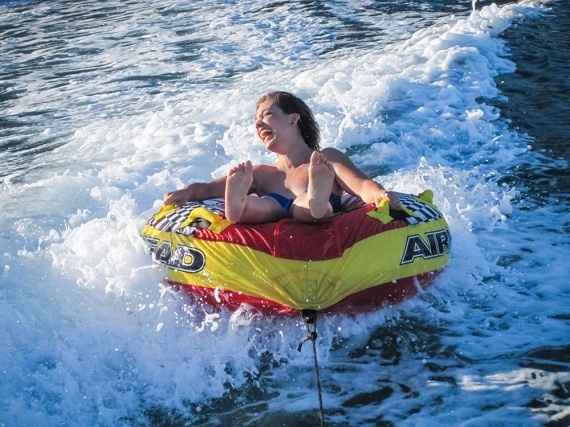 Tubing is incredibly fun: perfect for beginners, it’s done riding an inflatable boat by yourself or with a group. It’s great for kids too, accompanied by an adult. Wake surfing is a sport for everybody, it has no age limits and can be adapted for different levels of skill, satisfying both beginners and experts alike. It’s practiced on a board similar to a snowboard but larger. The “Sit-down hydrofoil” is a variation of water ski. When it’s towed – even at low speeds – the board flies over the water level, raised by its fin. It is only available by reservation, and it’s usually not recommended for beginners. If you want to spend an adventurous afternoon, we have what you need: we organize tours to the caves of Cala Fighera and all the best spots in the Gulf of Cagliari, and we’ll dive to visit some of the hidden treasures of our sea! Sail at sunset and live unforgettable moments with your family: you won’t need to worry about taking pictures, we’ll take care of that, so that you can have fun. It is possible to bring on board sandwiches or light snacks.